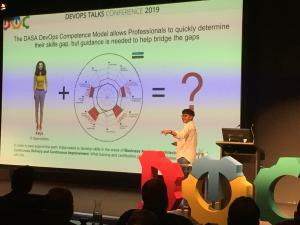 RALEIGH, NORTH CAROLINA, UNITED STATES, April 10, 2019 /EINPresswire.com/ -- As more and more enterprises move away from the traditional (waterfall/agile) software development methodologies to embrace a DevOps way of working. It becomes imperative that their IT professionals have a path to upskill their capabilities and evolve their existing profiles from just being a subject matter expert in one specific domain to expanding upon their skill sets and knowledge areas to acquire a more T-shaped profile. The T-shaped profile means they can be a subject matter expert in a particular domain while having a broad base of other competencies required for working in today’s fast-paced digital world. As Enterprise's move towards digitization, the need has arisen for them to help evolve and grow their workforce to be able to do more, which means providing them the necessary tools and training needed to ensure their most valuable resources (their people) can #1: identify their skills gaps, #2: provide a mapping of the training and certifications that prepares and certifies they have the skills and knowledge for their career development and future job roles and #3: their employers have happier employees that have a solid growth path within their companies. A critical factor to the adoption and growth of DevOps Agile Skills Association (DASA) by companies adopting a DevOps way of working is that we are an open, global members-driven organization. Our members play an active role in the development of our product roadmaps and the enhancements required to provide more customer value. 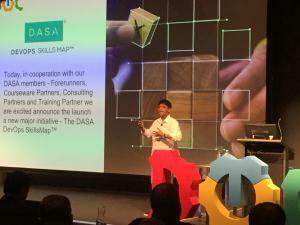 Case in point the new DASA DevOps SkillsMap™️ was born out of an internal project started at CGI Netherlands where a particular business line in their Insurance sector began plotting their individual consultant's skills to the DASA DevOps Competence model and DASA Certifications along with other best-practice training and certification courses provided by the CGI Academy in the Netherlands. "We wanted to demonstrate to our clients that our consultants have all of the required training, skills and certifications (proof) needed to get their job done, "says Mark Drost, Academy Director at CGI in the Netherlands. "We soon recognized that this was a much bigger project that we had spearheaded. That's why we reached out to DASA to investigate ways we could engage with other members in the community to start a more comprehensive skills mapping project. We were positively surprised of the number of enthusiastic and committed companies joining the DASA DevOps SkillsMap™️ initiative" says Drost. "Every day I am amazed at the grit and passion of our members. They represent the best-in-breed when it comes to thought leadership, making investments in building awareness for DevOps and DASA and their burning passion for helping their clients, their colleagues and others in the IT industry as a whole find a path to adopt the new IT way of working which is DevOps". 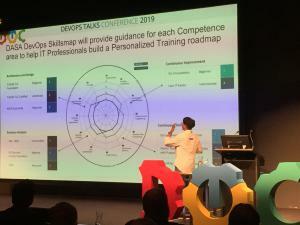 I was proud to announce the DASA DevOps SkillsMap™️initiative at the DevOps Talks Conference in Melbourne, Australia where DASA was a Platinum Sponsor on March 22nd of this year. Today, "I want to personally thank Mark, Thomas Marce, and his Insurance team for bringing us this project and helping us kick off our new SkillsMap™️ initiative within DASA's global community. As well as Thank and acknowledge the first inaugural group of DASA Consultant, Training and Exam Service Providers who have joined the DASA DevOps Skills Mapping project. Many thanks for your leadership to: Alten-Netherlands, APMG, the CCC, CGI-Netherlands, CTG-Belgium, GamingWorks, Glumin-Mexico, iSQI, ICT 1-2-3 in the Czech Republic & Slovakia, ITpreneurs, ITSM Group-Germany, Quint Wellington Redwood, Knowit, Valcon Consulting, Werner Consulting-Germany, and Xebia says, Deborah Burton, Managing Director of DASA. There is such an extensive amount of other training and certification programs available in the market that address specific competencies relevant to DevOps teams that will help individuals build their IT expertise. The purpose of our mapping initiative is to provide a framework for other companies to map their programs to DASA’s DevOps competence model easily. We believe this will help individuals and companies and their HR departments enormously in providing the roadmaps that will help simplify the routes they will need to take to upskill their people as it allows them to map internal curricula, available learning programs, and learning paths to the DASA DevOps Competence Model. DASA invite all of those that have IT training and certifications that they believe will help IT professionals develop the skills to meet the requirements of the future roles and career paths to join us.